Have you been enjoying our ‘month of flower DIYs’ so far? We’ve created a table plan, napkins, flower wrapping and we’ve got so much more to share with you! 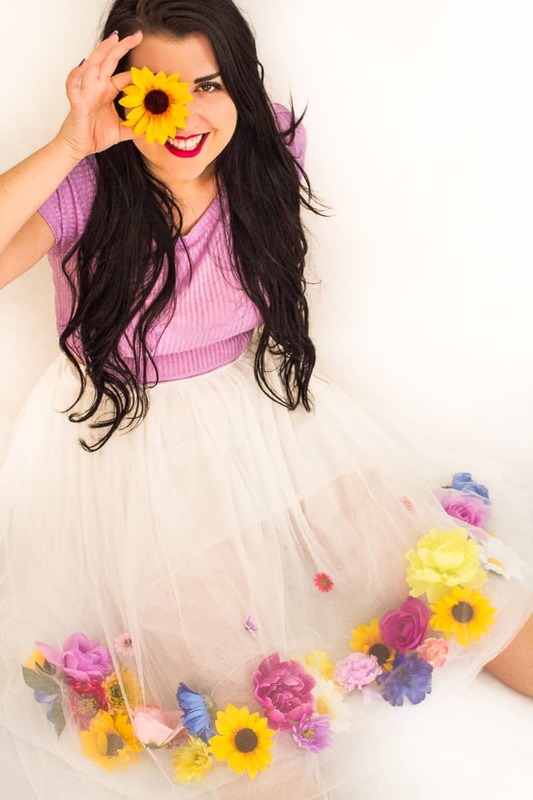 Today we’re taking a turn into fashion as we show you how you can make your very own DIY flower tulle skirt! We’ll let you in on a little secret too…this whole DIY cost us less than £30! How beautiful would these look on you spring/summer brides or even on your bridesmaids or flower girls! Take the top layer of tulle and keep it separate from the rest of the skirt (we just tied ours up with a hair bobble). You’ll want to glue the flowers to the layer underneath the top one so that the top layer of tulle can sit pretty over top of your flowers. Using your glue gun start to glue your flowers near the bottom of your skirt, we decided not to go too close to the edge so that the top layer of tulle would fall nicely over top of the flowers. Continue all the way along your skirt until you’re happy with the placement and amount of all your flowers. We decided to add a few smaller flowers slightly higher on up the skirt too! Finally, untie that top section of tulle and let it fall down overtop of the rest of the layers. We found ours on Ebay and they were super cheap! If I were to make this for my girls, knowing they’ll wear it often and it require washing, how well does this wash? Can I put it in the washing machine on a gentle cycle? Will the glue hold up? Hot glue is pretty strong stuff so it should hold up pretty well on a gentle cycle. We glued directly to the tulle on our skirt.